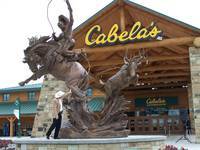 "A Leaf on a Stream", Hamburg, Pennsylvania in 2003 - Cabela's. 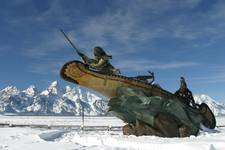 This picture is taken from the backyard of one of our collectors in Jackson Hole, Wyoming. 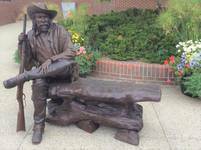 "Ancient Hunter" - Located at Dr. Lon & Linda Mellijor's home in IL. 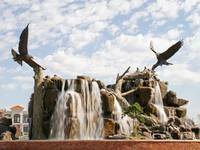 "Another Year to Grow", Unveiled in 2007 at Hoffman Estates, IL for Cabela's. 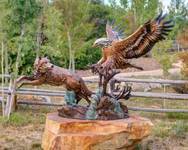 "Eagle Catcher" - Resale, 2ndary Market *This was the first monumental bronze that Vic created and quickly became known as his signature bronze. 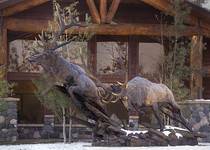 "Good Ole Days" - Unveiled in 2007 at Gonzales, Louisiana for Cabela's. 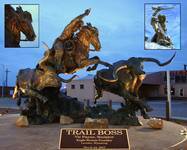 "Memories", Unveiled in 2005 at Buda, Texas for Cabela's. 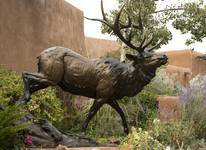 "September Morning" - Twice life size fighting bull elk. 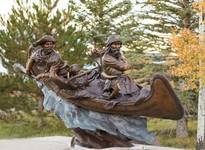 Dedicated on September 20, 2008 at the AmericInn Lodge in Cody, Wyoming. "Sky King" Commissioned by Embry-Riddle Aeronautical University and made possible through the generosity of Dr. Helen Wessel. 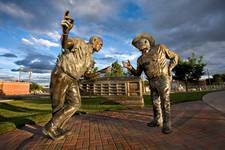 "Texas Two Step", Fort Worth, Texas, unveiled the summer of 2005. 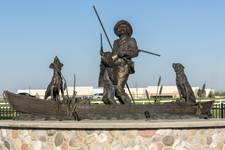 "The Derrick Floor", dedicated on April 24, 2004 in Artesia, New Mexico by Artesia MainStreet. "The Hunter Becomes the Hunted" * One of these beautiful sculptures has recently became available on the 2ndary Art Market. Please call Vic Payne Studio for details. 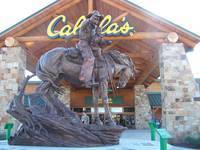 "Where Eagles Dare" - Monument 1 1/4 life size, unveiled at Cabela's in Wheeling, West Virginia, 2004. "Where the Buffalo Roam" *** One available on the 2nd Art Market list.